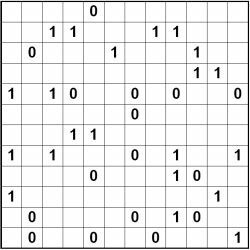 Binary puzzles, also known as binaire puzzels in some European countries, are played on a rectangular or square grid. At the start of the puzzle, there are three possible states in which a cell can be: it can be empty, it can contain a zero, or it can contain a one. In the completed puzzle, there are only two valid states: either a cell contains a 1 or a 0. And hence the name of the puzzle: the Binary Puzzle. Repetition: no more than two cells in a row can contain the same number. Thus if there is a '1,1' then the cells either side must be '0'. Equality: there must be an equal number of 0's and 1's in each row and column of the puzzle. Therefore there are the same number of 0's and 1's in the finished grid. There is also a popular variant on the basic binary puzzle, in which each row and column must be unique, thus if the row '101010' appeared in a 6 x 6 puzzle then no other row or column could be identical. As with most logic puzzles, there is only one solution, and that solution can be reached without any guesswork at all, but rather by simply applying basic logical rules that follow on from the rules of the game. The simplest rule is to look for occasions where the same number occurs adjacent to itself in two cells, because then you know that the cells around that double occurrence must be the other number. There is also a counting rule: if you know that in an 8x8 puzzle that there are 4 occurrences each of the zero and the one in a region then you can use this information to reduce the possible options for that row or column based on the numbers that are already placed (the givens) in that region of the binary puzzle. Puzzles can be created in a range of difficulty levels, and in addition in a large range of different grid sizes too. Binary puzzles are usually supplied in PDF format, complete with solution. If you wish to buy binary puzzles (binaire puzzels) for publication, please do get in touch. Publishers - Please contact us to buy Binary Puzzles puzzles for publication in your book, magazine, newspaper, any other printed media or online.